Our company’s kitchen can be found in Miskolc at József Attila u. 25.-27. We own a territory of 420 m2. The serving capacity of the kitchen is 1200 dishes. The technical and technologocal development of our kitchen represent the most modern technics. We modernized our equipments last year with the help of the Magyar Vállalkozásfejlesztási non-profit company. We serve the individual clients from this highly modernized kitchen every day. After preparing the dishes and serving them into plastic boxes, we also wrap them with a layer of foil to keep the high quality of the food. The helpful and pleasent-looking colleagues of our company start to deliver the dishes for the customers from this kitchen. They use the fleet of vehicles of our company to deliver all around the county. Increasing the circle of our regular costumers stands in the middle of increasing and developing our market shares. In order to reach our goal we are expanding the range of our products. We offer our services on the market for those who are in need of special meals. 10% of Hungary’s population is suffering from diabetes and 2% of celiac disease. Our company’s catering manager compiles a special diet for these costumers. We are planning to start this service expansion at the begining of 2010. 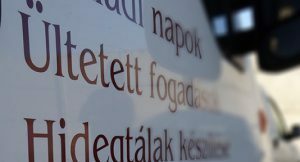 Our company is a member of the Hungarian Association Of Beverage and Snack Automats (MIÁSZ) and the Hungarian National Gastronomic Association (MNGSZ). Benefits of the membership includes continuous organisation of trainings and exchanging experiences. Our colleagues are participating in these trainings and they were also present at the trainings of the Élelmezésvezetők Országos Szövetsége. In case of a small regional company the every-day-focus is on the needs of the Multinational principal. We satisfy these needs according to the daily contacts, meetings. These ensure the constant execution and enxchanging of strategy. We need new challenges every day to meet future demands. The advantages of our company is the smaller organizational structure, the quick reaction time and the efficient implementation of short-lies. For the transpotation of food and for procuring some of the raw materials we have vehicles which possess the exam of the ÁNTSZ and are licensed.